Listen to "Fantasy Baseball: Ralph Lifshitz 2019 Tout Wars Auction Recap" on Spreaker. There are moments in your life where you remember exactly where you were and what you were doing. There are others that go beyond that, some that begin a journey of sorts, large chunks of moments that stick with you for eternity. I had one of those moments recently, and it was the kind that began a journey in some ways. It was atypical Tuesday afternoon at my desk, sorting through emails, responding to clients, sneaking the faint glance at a video, article, Twitter, etc. I checked my personal email, and immediately my eyes were drawn to an email from Jeff Erickson of Rotowire. I hadn’t had any correspondence whatsoever with Jeff in the past, so it had to be one of two things, 1. Jeff was commending me on my handsomeness (unlikely) or 2. I was getting the invite to Tout Wars in New York City! This was one of those moments. If you’re not familiar with Tout Wars, it’s a fantasy baseball competition that takes place in New York every year dating back to 1997. The founder of the competition is Ron Shandler, creator of the world renowned Baseball Forecaster. Tout Wars is comprised of five distinctly different leagues. You can peruse the constitution, league setups, and the league rosters themselves here. I personally had the honor of participating in the head to head points league auction. The draft was held in the Fishbowl at Sirus XM headquarters in New York. I drove into the city that morning with my wife. I’m such a romantic, I wanted to turn Tout Wars into an intimate trip with her, me, and 50 fantasy nerds. What girl doesn’t dream of listening to people discuss ADP, auction value, and team building strategy? For the record my wife does not. I wanted to make that clear. In case you actually take anything I say seriously. We arrived in Manhattan around 3 p.m., the auction started at 6 p.m. So we settled in, checked in, and met up with Grey Albright of Razzball for a couple of drinks before we walked over. Getting there around 10 minutes before draft time, I walked in and setup my computer in the back and began to prep my draft board and notes. This is probably a good time to introduce my strategy and some of the prep work that went into formulating it. I started my prep a week or so in advance, as is customary for all of my drafts I applied projections from Rudy Gamble at Razzball to the scoring. I actually didn’t do this myself, because I’m not that smart, but luckily the top Aussie in fantasy baseball Steve Ross is, and hooked me up with the applied projections. Initially my impression upon looking at the scoring is the same take you’ve heard from Paul Sporer, Justin Mason, Joe Pisapia, and others. Pitchers were incredibly devalued by the scoring. A little history on that, if I may be ADD for a momento. Last season the scoring was more of a traditional points setup where pitchers scored a ton of points. Unfortunately there was lack of restraints on rosters and I guess it led to a really slanted strategy. This year they decided to re-work everything and devised a scoring format that is very unconventional. The scoring was adjusted in a way that Josh Bell scored as many total points as Max Scherzer based on projections. So the scoring was heavily slanted against pitchers… or was it? More on that later. What’s most unusual about the scoring scoring setup is the way the head to head weeks are scored. There’s three total categories, Team A’s hitting vs Team B’s hitting with the winner awarded two points for each week. The same goes for the pitching matchups, with the rubber match between hitting and pitching decided by a third category of combined total points. This element led to some division regarding the value of pitching, and whether or not it was worth it at all. If it’s one small portion of the scoring and hitters score a lot more than pitchers wouldn’t it stand to reason that the team with the best hitting would win at least four points a week? Possibly, and as I stated before that seemed like the likely strategy I would take, load up on hitters and go full Labadini on the pitching. This strategy was laid out by Justin Mason here. After reading Justin’s post I figured that at the very least Paul Sporer would approach it this way, and sure enough he did. I went back to Steve Ross, my Aussie Braintrust to discuss, and he alerted me to something I had glossed over a bit, Net Points. What’s Net Points? Well it’s essentially WAR for the point scoring. It identifies the difference between a player and the median player at that position, i.e. a replacement value player. Upon looking at this two things were very clear: pitchers, particularly elite starters and a lot of closers, were significantly higher in net points ranking than they were in the scoring, and there was a fair amount of value in closers. As I started to dig deeper I started to identify a major oversight in my earlier perspective, the delta between the elite of the elite starters (Scherzer, Sale, DeGrom) and the guys between 10-15 (Trevor Bauer, Severino, Thor) was 100-130 points in net value, equating to the difference between Andrew Benintendi and Josh Bell. So perhaps elite starters were a major difference maker in weekly overall matchup totals when so many hitters were scoring 400+ points (80 hitters are projected for 400 or more points). The other noticeable impact the scoring had on pitchers was not only the lack of starters that had projected triple-digit point totals (26 in total), but the number of starters that were projected for 50 total points or less. Not only did one elite pitcher seem like a must own but another from the top 10 seemed necessity as well, and possibly a third from the top 26 of 100 potential point scoring. My reasoning behind this is as follows: the ability to find value and strong contributors offensively were in abundance. Pitchers, starting pitchers in particular with any value were a much, much different story. So I entered the draft with the intent of spending 60% of my budget on hitting and 40% on pitching, but as policy I’m never rigid to any set standard. 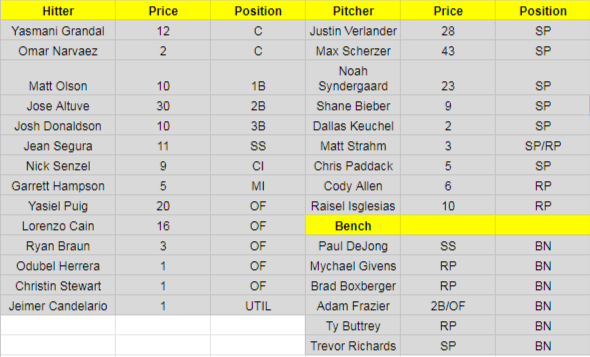 Auctions and drafts never go how you expect so I was certainly prepared to pivot and split my budget evenly if it seemed like top starters were going a little undervalued. Picking up where we left off in the first section, I arrived at the auction a few minutes before 6 p.m. and set up my scoring values and draft board as the room filled with names you know like Paul Sporer, Clay Link, Ryan Bloomfield, Alex Chamberlin, Ian Kahn, and others. I spent a few days scouting any and all written material pertaining to the auction, and just general ranks and articles to get a good idea of who my competing bidders might be on my target players. The Pitching…. You spent how much? The auction started and one of the first players nominated was Justin Verlander, a player I very much wanted to win. I tend to attack early in auctions as the first 3-5 players tend to go for a little undervalue, and that’s just what happened with Verlander. I have Mr. Kate Upton ranked fifth among my starter ranks, and had a value on him of $35, so when I was able to walk away with JV at $28 I was pretty happy. This was my top target in the auction, after reviewing the above strategy it seemed like Max was a must have. Paired with Verlander and $71 off the board I told myself I would hold off on pitching for awhile. However, that didn’t last too long. Perhaps I was caught up in the moment, or maybe I just really liked the price, either way I jumped in on Thor and never relinquished his hammer. In my opinion this was my riskiest win of the auction. While Syndergaard has shown the ability to dominate, his health is a mixed bag. I’m willing to chalk it up to luck and look forward to the results my three-headed monster can provide me. There were some questions about this win, and honestly Ryan Bloomfield used the strategy I was considering with a “handful of closers” as he called it, and the prices went higher than I expected. I went for the draft skills not roles philosophy here and took the best arm in the Reds pen. Could Iglesias lose out on saves? Yes! Is that ideal in this scoring? No! But the cream tends to rise to the top and I think he’s a solid number one closer. I’m a big fan of Shane Bieber’s game dating back two years, I’m a fan of elite feel and control, it’s why I love Chris Paddack and it’s why I like Shane Bieber. With a year of experience under his belt and Cleveland’s track record with home grown arms I expect big things. Okay, so I chased saves not skills with this win, sue me. Saves are worth a lot and I have a sneaking suspicion that we see Allen continue to whistle by the graveyard while racking up some saves for an underrated Angels club. Just in case he falters early I grabbed Ty Buttrey in the reserve rounds for good measure. The hottest name of the off-season, and someone I personally planted a flag in a few weeks ago. This pick is very on brand. This is my staying on brand face. How does it look? Love the skills, love that he’s finally going to get an opportunity in the rotation. Wait and see, but this might be one of my best deals of the auction five months from now. I threw this one out there and no one bit, so I swallowed Keuchel at $2. Wow that sounds awful! Seriously, have no issue with eating this one, even if he ends up sitting out the whole season or playing the Big Baller Baseball League, this is a win. Imagine if he lands back with Houston or the Braves bit the bullet and bring him to the NL? Neither are bad destinations, and Keuchel will be expected to go deep into starts, provide quality innings, and win games. That plays in this format. The Hitting… Wait You Still Had Money For Hitting?!?! The 15th ranked hitter in the format based on my projections to the scoring, and I think there might even be a little ceiling. If Altuve is fully healthy for the entire season he should provide top 5-10 value overall. Perfect player for this format with the elite approach and across the board production. The projections love Puig, he’s in a great home park tailor-made for his game, and he’s in a contract year. Perhaps I’m foolish, but I foresee the strongest season of Puig’s career in 2019. The $20 price tag looks like one I will live to love or regret. There’s no middle with Puig. While it would be false to say home runs don’t matter in this format, because they do, but all around contributors with great approach have long been the focus of my points league builds. I have Cain projected for about 450 points for the season, not sure if that’s optimistic or not, but it places him in the top 15 or so at the position. Really liked this buy at $16. Going back to the concept of net value, Grandal fits right in with that strategy. When you consider the scarcity of production at the catcher position, it’s a small but helpful advantage to get production from your catcher spot. I paid up but I feel comfortable with Grandal as a core player. In a 12-team league I’m more likely to play the wire to exploit cushy road or home matchups than I would be in a 15 or deeper. Based on my projections I have Segura as a 430-440 point player on the season. I’m optimistic about Segura in a stacked Phillies lineup in the best power park in the league. Once again a player with a high net point value I landed on the cheap. He’s on the older side, he’s been hampered by injuries the last 12+ months, but we’re not all that far removed from his 33 home run campaign in 2017. If JD is healthy he’s going to mash. I don’t want to talk about it. I loved me some Olson, thought he had a legitimate chance at 35+ bombs. Now he’ll rot on my bench until his hand heals. He’s not breaking camp with the Reds, but Senzel should be up in short order with the news of Scooter Gennett’s injury. Whether that’s as an outfielder or infielder remains to be seen. I love Senzel, this was a steer off the projections, and simply a player I love. Winning Hampson, Senzel, and Paddack was very on brand. I like Hampson’s chances even if he’s on the short side of a platoon with Ryan McMahon early. Hampson can ball. Players that Braun is projected to outscore this season Vladimir Guerrero Jr., Adalberto Mondesi, and Gleyber Torres. It’s Braun, he’s old, he’ll miss games, but he’s a dark horse for 400+ points. All hitters with a decent shot to outperform their dollar value 10 fold if things go well, at worst I cut bait. I’m optimistic with this group.